Aloe dichotoma's name has been derived from the dichotomous or forked branches. 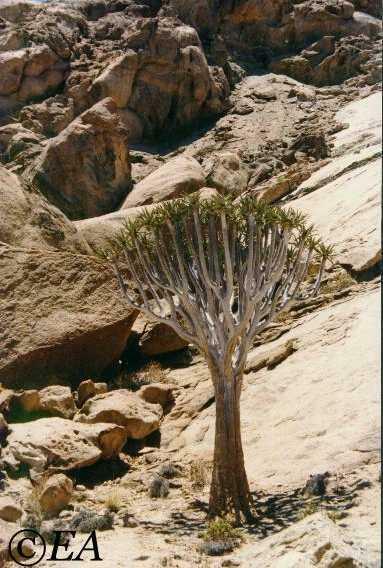 The common name, Quiver Tree or Kokerboom, has been derived from the traditional use of hollowing out stems to carry arrows by the San people. Aloe dichotoma can also be distinguished from Aloe barberae by the latter having larger and greener deeply channeled leaves. Although there are forms that resemble both Aloe pillansii and Aloe ramosissima one can distinguish between the species by leaf shape, as wthl A. pillansii, and with the presence of a trunk with A. ramosissima. Juvenile plants have leaves that are ranked in vertical rows but rosettes gradually form this as the plants turn into mature specimens. Common Names: Kokerboom, Tree Aloe, Quiver Tree, Choje (Bushman Name). Status: Aloe dichotoma is not a threatened species and it's South African national tree number is 29. Distribution: Found in Namaqualand and Bushmanland from Nieuwoudtville northwards into Namibia and eastwards to Upington and Kenhardt. Aloe dichotoma are found in very arid areas, usually on rocky north-facing hills. Aloe dichotoma is a 3.5m to 4.5m tall Tree Aloe, the branches are smooth to the touch while the trunk have large brown scales that are sharp to the touch. Leaves are blue-green in colour and are borne on small terminal rosettes. Leaves are oblong and narrow in shape, 300mm long and approximately 50mm at the base. Leaf margins have fine inconspicuous teeth. The inflorescence is short and erect with three to five racemes. The bright yellow flowers, 3cm long, develop on branched spikes in June through August. Notes: Full sun to light shade, light frost protection required, drought resistant. min temp -1C - 4C (USDA 8 - 10). Picture: Aloe dichotoma in habitat to the se of Walvisbay.